America’s farm families and communities would be put at heightened risk by increased exposure to 2,4-D. Farmers would inhale it and get it on their skins while spraying it. The chemical could drift from sprayed fields into nearby neighborhoods. People would track it into their homes. The damage can reach beyond the farmers who live close to sprayed areas. In fact, once it is sprayed, 2,4-D can transform into a gas and float to both nearby and distant fields. Pesticide drift can have dire consequences for crop yields. 2,4-D could damage or completely destroy acres of potential harvests. In California in 2012, drifting 2,4-D wiped out nearly 15,000 acres of cotton and a valuable pomegranate orchard. 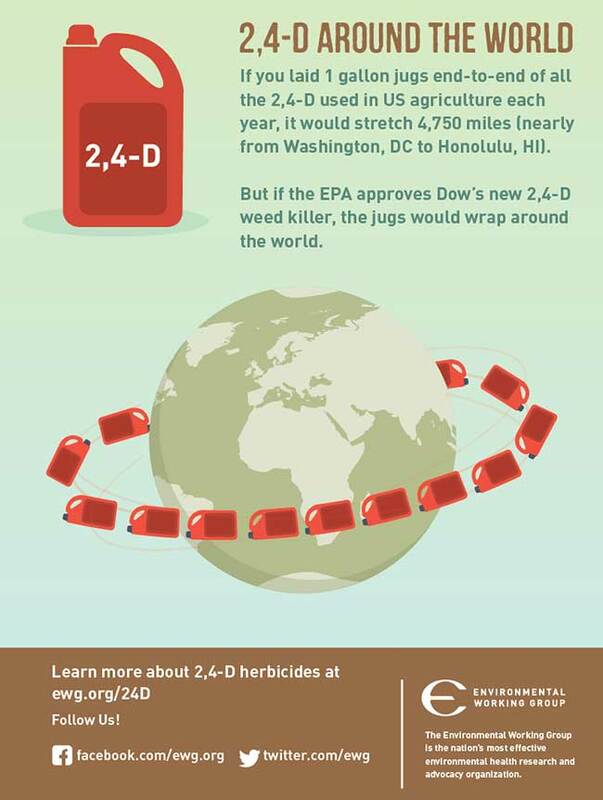 Even at the current levels of use, 2,4-D is responsible for more episodes of drift-related crop injury than any other herbicide. Farmers whose fields are plagued with unwanted pesticides and herbicides that have drifted from other farmers’ fields may end up forfeiting all or part of their harvest for a season. Organic farmers could lose not only their harvests but also their organic certifications, because organic farming prohibits the use of almost all chemical pesticides. An heirloom tomato farmer in Mississippi experienced such a loss earlier this year. USDA organic certification rules require that land be free of banned pesticides and other chemicals for three years. An organic farmer’s livelihood can be swept away by a single gust of wind.